Putin has warned that U.S. action over Ukraine would have a boomerang effect. Will the target be Asia? Last week I noted four lessons Asia watchers should ponder in light of the events unfolding in Ukraine. As there has been no letup and various pundits warn of a new Cold War it seems timely to consider what actions Russia could take against the United States if tensions were to spiral out of control. Clearly Vladimir Putin has a number of options to create significant havoc in multiple areas of American national interest—especially in Asia. 1. Russian Arms Sales to China go hog wild – Remember that deal that keeps floating around concerning Russian SU-35s and advanced conventional submarines to China? Even if things don’t get worse in Ukraine, I think we can consider that a done deal now. But, heck, why stop there! 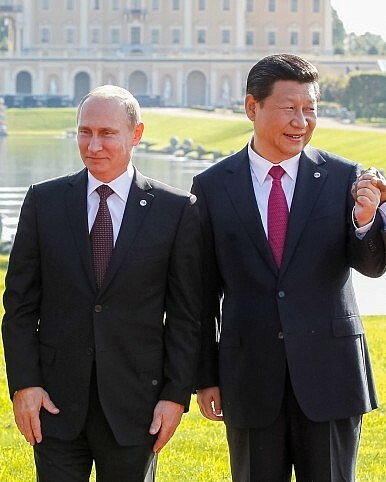 If Washington wants to keep upping the ante in Ukraine it might be a great time for Moscow to expand its dealings with China to levels never seen. Remember all that talk about hypersonic weapons in January? Since both nations are pursing such weapons, why not share the costs and the spoils? It seems 5th generation fighters aren’t easy for anyone to craft these days—so why not a joint Russo-Sino development project? If things were to get really nasty, and Russia decided to pull out of the INF treaty, maybe it’s time Moscow and Beijing exchange notes on all those lovely A2/AD weapons systems we like to talk about here on Flashpoints? I could go on and on. The bottom line: If Russia wanted to make things hard for America in Asia at a time when its defense budget is shrinking, here is an easy way to do it. 2. Moscow goes all in on natural resource sales to Beijing – While large deals were announced late last year, China would love to purchase as much Russian oil, natural gas and any other natural resources it could get its hands on. While issues of price have slowed or halted other deals in the past, Russia this time might be a little more flexible, especially if it were to halt or slow sales to Ukraine or Western Europe. China clearly wins in such a deal as it would become less reliant on sea-borne natural resources imports that could be disrupted if things with America were to go really south. 3. Russian Arms Sales to Iran, Rebooted – While any analysis here must factor in P5+1 negotiations over Tehran’s nuclear deal, Moscow could seek to make trouble for Washington and its allies by rebooting arms sales to Iran. With Russia and Iran already trying to work out the aftermath of an aborted sale of the S-300 air defense system, Putin may decide to put the system back on the table for Iran. In fact, he may even suggest selling Tehran the more advanced S-400 system. Consider this: if nuclear negotiations fail and Iran fears an attack by the West over its nuclear facilities, Russia could be in position to supply all the weapons it needs to make such an attack even more complicated than it would already be. 4. Syria: Give Assad all the arms he wants: While Russia may have offered an unlikely solution to the chemical weapons crisis of last summer, the U.S. and its allies should expect nothing from Moscow if Putin’s boomerang comes lunging back at them. Putin could easily begin sending even more arms to his allies in Syria, raising the stakes and a death toll that is already reaching epic if not historic proportions. While it may be hard to envision Russia being able to completely turn the tide with Assad winning a clear victory, Moscow could certainly change the calculus if it decided to go all in and arm Syria to the teeth. 5. The Death of the Pivot/Rebalance: So say tensions in Eastern Europe were to escalate even further with Russia formally annexing Crimea or worse—Russia taking large sections of Eastern Ukraine. It does not seem out of the question that Washington would be forced to consider beefing up its security commitments in Europe. While additional forces could certainly move into the region as a deterrent to further Russia troublemaking, missile defense plans scuttled in the past could be re-crafted, and U.S. naval power could make a strong comeback. All this comes at a price however. Unless the U.S. were to increase its defense spending which, short of a shooting war I consider unlikely, American forces, already stretched thin to begin with, would be even more strained. Washington may simply have no choice but to reconsider its mighty pivot/rebalance to Asia. Add in the fact that a senior defense department official may have put the final coffin in it anyway– stating that “right now, the pivot is being looked at again, because candidly it can’t happen”– one more nail for good measure thanks to Russia would certainly seal its fate. The advanced air and missile defense system will strengthen China vis-à-vis Taiwan, Japan and India. Will Russia Regret “Owning” Syria?Putin’s Russia: The Pretend Great Power How Putin Can Retaliate Against ObamaWith Hanoi in the Rearview, Will Kim Jong Un Turn to Russia?What Does Iran Really Think of China?